AMSOIL Synthetic Heavy Duty Diesel & Marine Motor Oil is a premium diesel oil providing excellent performance in all types of diesel engines where highly effective control of wear and deposits is vital. Engineered with heavy-duty dispersant/detergent additives, its Total Base Number (TBN) of 12 neutralizes acids and controls soot thickening from Exhaust Gas Recirculation (EGR) and blow-by to protect against corrosion, cylinder bore polishing (wear) and varnish/sludge deposits. AMSOIL 15W-40 Diesel Oil resists heat and breakdown better than conventional petroleum oils for long-lasting performance and protection. AMSOIL AME has lower volatility (evaporation) than conventional petroleum oils. Because less oil vapor passes into the combustion chamber, oil consumption and emissions are reduced. Lower volatility helps AMSOIL AME retain its viscosity after high temperature service for excellent fuel economy and continued dependable protection. AMSOIL Synthetic Heavy Duty Diesel & Marine Motor Oil is engineered for use in a wide variety of light and heavy-duty applications, including over-the-road trucks, off road construction, marine engines, farm equipment, mining, industrial (pumps & generators) and personal automotive or commercial transportation. It is excellent for use with low or high sulfur diesel fuels in standard, turbocharged or supercharged engines, including modern low emission diesels such as those equipped with EGR systems. AMSOIL Synthetic Heavy Duty Diesel & Marine Motor Oil is recommended for use in diesel engines and other applications requiring any of the listed worldwide specifications and gasoline engines requiring API SL, SJ, SH or ACEA A3. 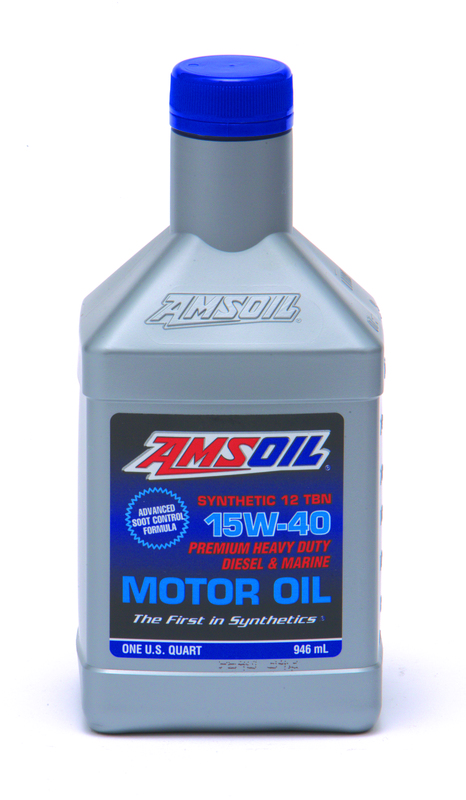 AMSOIL Synthetic 15W-40 Heavy Duty Diesel and Marine Motor Oil (AME) is recommended for extended drain intervals in engines that are unmodified and in good operating condition.